Twitter is promoting ‘Black Lives Matter’ in their new advertising campaign. In a one minute advertisement for Twitter #GoLive the company promotes the violent leftwing riot group Black Lives Matter. This group promoted by outgoing President Barack Obama is widely blamed for the destruction in numerous locations around the US (e.g. Ferguson, Baltimore, Dallas, etc…) and for the deaths of many US police men and women. So as Twitter and other social media sites impair the free speech of conservatives around the country through various means, they promote violence and hate. Obama caused the war, not Putin. Putin stopped the war. The man is correct. Obama and Hillary Clinton provided guns to Syrian rebels that morphed into ISIS. This was shortly after Obama received a Nobel Peace Prize. 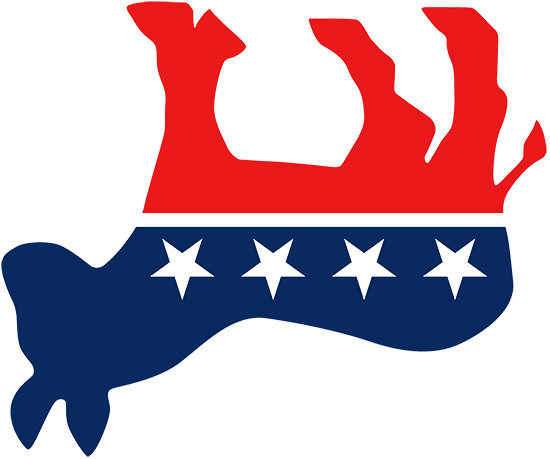 The Democratic Party’s response to their recent shellacking in the November 2016 elections is to blame the results on everything but their terrible candidate and terrible policies. Democrats first blamed the 10% of the media that they don’t control as the reason for their demise. This is in part true. Americans by the millions went to sites like this one to obtain fair and unbiased news reporting during this election cycle. At the same time WikiLeaks released Hillary campaign manager John Podesta emails that showed that the Democrats have nearly total control of the media. The Democrats believe if they stop free speech all together they can then win elections. They don’t consider changing their positions. The Democrats next blamed Russia for interfering with the election and giving Trump the win. This insanity puts not only the US election process in peril, it also puts the US relations with Russia back to the Cold War era. If the Russians wanted a particular candidate to win in this year’s election, it was Hillary Clinton. She gave them the Russian reset, uranium in the US and an easy rode in their takeover of Crimea, etc. Finally, the Democrats are trying to overturn the election by requesting that the Republican Electoral College candidates vote not for Trump but for anyone else – they are not saying vote for Hillary, wink, wink…. What arrogant and misguided lefties. They really do come across as sore dumb losers. As the Democrats continue with their madness of blaming everyone and everything for their loss instead of themselves, Republicans are quick to encourage Democrats to look within like they did after the 2012 election loss to Obama. Let’s hope they do. Some in the Republican Party think that their Takeaways from the 2012 election are what won the 2016 election. This was not the case. If not for Trump it is highly unlikely that the Republican Party would be celebrating a White House win. We can only hope the Democrats create a similar list of takeaways that prevent them from winning in the future as well. Forbes released it current list of the World’s Most Powerful People. Russia’s Vladimir Putin was listed at number one on the list with President-Elect Donald Trump listed at number two. Angela Merkel of Germany was number three. Way down the list at number 48 is the current President of the United States, Barack Obama. Kim Jong-un of North Korea was listed above Obama at number 43. China stole a US underwater drone while the US watched on Thursday in the South China Sea. Obama’s lack of a response probably didn’t halt his free-fall on the list of World’s Most Powerful. During the months leading up to the election, we recorded and reported the number of participants at President Elect Donald J. Trump’s rallies and compared these to participation at Hillary Clinton rallies. It was clear early on that Trump was holding more rallies and getting much larger crowds at his rallies than Clinton. We attempted to obtain and track numbers at rallies but we soon learned a few things that made our task difficult. The Main Stream Media (MSM) rarely, if ever, reported the size of the crowds at the rallies because, we presume, that it was very clear that Hillary was getting way outperformed in this area. Also, when the MSM did report numbers they always overstated Clinton’s participation while understating Trump’s. In order to obtain accurate data we had to many times look at multiple sources. The left wing socialist media discounted our analysis and reported that rally ‘size doesn’t matter’. As the election results came in we were right. We’re always right. We predicted a Trump win and probable landslide and that’s what happened. Donald Trump clearly worked harder than Hillary Clinton in the months leading up to the election with 132 rallies to Clinton’s 63 and it paid off with the election win. Also, he entertained nearly 1 million supporters at his rallies to Clinton’s 110,000. Also, Clinton took 57 days off between August 1st and the election where she held no rally. This was more than half of the 99 days between August and election day. Now there is even more evidence that the enthusiasm of a winning campaign does is very important! Since the election Trump has held ‘Victory Tour’ rallies. These rallies started on December 1st with a rally in Cincinnati, Ohio. Trump then made stops in Des Monies, Iowa; Fayetteville; North Carolina; Baton Rouge, Louisiana; Grand Rapids, Michigan; West Allis, Wisconsin; and Hershey, Pennsylvania. Yesterday, on Friday, December 16th, Trump spoke to supporters in Orlando, Florida at the Central Florida Fairgrounds. Trump has another event scheduled to take place today in Mobile, Alabama. Meanwhile Hillary Clinton has held no rallies since the election. Today it is clear more than ever that rallies do matter! Daniel Greenfield at the website Front Page Mag wrote a scathing essay on the current president titled: The Obama Era Is Over. The Obama era was permanent. It was history. Obama’s America is over and it was nothing short of a horror film. The US suffered and the world suffered in the Obama years. When Obama had a Democratic Congress he gave us a Trillion dollar ‘stimulus’ that was nothing more than handouts to his friends and he also gave us the healthcare mess known as ‘Obamacare’. When he lost Congress he then said famously that “I’ve got a pen and I’ve got a phone!”. 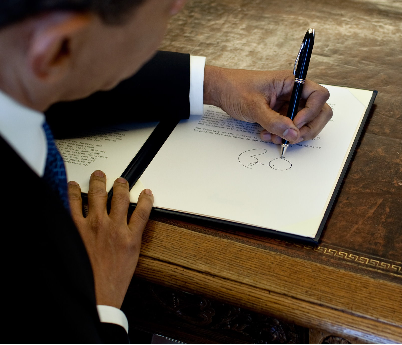 He used these to push through his socialist ideas through executive orders. Soon Obama will be just a bad story in history. Ironically on the other side of the world a silly song by PPAP and variations of the song have more than 100 million YouTube views. The song is about a man who has a pen and an apple and a pineapple. The question in 20 years will be, which of these two men with a pen will be remembered longer and respected more? The Obama – Yellen Federal Reserve raised interest rates today and as a result halted the DOW’s 7 day win streak. In an effort to steal Trump’s thunder, Obama and Fed Chairman Yellon upped interest rates today for only the second time in the last 10 years. The Fed also hinted at future increases in 2017. The Trump Stock Market Rally since the election is of historical proportions. What we have seen since President-Elect Donald Trump won the election on November 8th, has never occurred before. Out of 25 days since the election, the Dow has reached all time closing highs 16 of these days! On another five of these days the Dow landed at its second highest close ever up to that date! For nearly a third of the closings since the election, the Dow has reached new highs. For more than 84% of the closing bells the Dow has either reached a new high or its second highest closing to date. For only four days (including today) since the election, the Dow has not reached one of these two milestones. The DOW has increased more than 6% during this time. This Trump Rally is Historical! We downloaded all daily closing amounts of the Dow Jones Industrial Average since January 5th of 1905 – more than 110 years of daily Dow closing data to compare the ‘Trump Rally’ to other rallies in the history of the Dow. 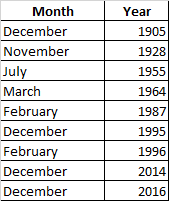 From an updated analysis of this data, there are only 9 times in the history of the Dow where the Dow set new closing highs for 16 days or more in a 25 day period. The DOW has never in its history reached the number of closing bell highs after an election. (The rally in 1928 started in October before the election.) Under Obama new Dow Jones daily closing highs were sparse. The last high before the November 8th election was in August. This is why the ‘Trump Rally’ is such an anomaly and so exciting. It looks like even Obama and Yellen are tired of Trump winning. Football Great Jim Brown Yesterday – I Fell in Love with Trump! President elect Donald Trump met with many people yesterday including football greats Jim Brown and Ray Lewis. Brown, who admits voting for Hillary, was very impressed with Trump. Brown said in an interview at CNN that he “fell in love with him [Trump]”. The President-elect has already said he’s in. We made a presentation to him about economic development in the black community, about families, about the state of our black communities in this discussion. And he realizes that with the education and the attack on the violence that takes place that we can then get on the right track…. He’s [Trump] not a phony. Trump’s Stock Market Rally Continues Historic Pace – Has Never Occurred in 110 Years! The ‘TRUMP STOCK MARKET RALLY’ continues to shatter the record books. What we have seen since President-Elect Donald Trump won the Presidential election on November 8th, has never occurred before. Out of 23 days since the election, the Dow has reached all time closing highs 15 of these days! For more than 65% of the closings since the election, the Dow has reached new highs. For more than 87% of the closing bells the Dow has either reached a new high or its second highest closing to date. For only three days since the election, the Dow has not reached one of these two milestones. The DOW has increased more than 6% during this time. This Trump Rally is an Historical Event! 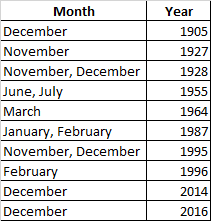 From an updated analysis of this data, there are only 10 times in the history of the Dow where the Dow set new closing highs for 15 days or more in a 22 day period. The only other time in history where the Dow reached such significant highs after an election was in 1928 when Herbert Hoover was elected President. The difference between now and then is that there were numerous new Dow daily closing highs in the ‘Roaring 20’s’. Under Obama new Dow Jones daily closing highs were sparse. The last high before the election on November 8th was in August. This is why the ‘Trump Rally’ is such an anomaly. Trump was getting massive numbers at his rallies before the election, now he is getting massive stock rallies since being elected President of the United States of America! America is hopeful again! On Friday Anti-Islam Dutch MP Geert Wilders was found guilty of inciting racial discrimination in the Netherlands. Wilders was found guilty of inciting racial discrimination for leading a chant calling for fewer Moroccans in the Netherlands. The presiding Judge Hendrik Steenhuis said the court would not impose a sentence because the conviction was punishment enough for a democratically elected lawmaker. Prosecutors had asked the judges to fine him 5,000 euros (£4,200). At this year’s RNC the Gateway Pundit, Jim Hoft, hosted a ‘Wake Up’ party which was attended by conservative champions Pamela Geller, Milo Yiannopoulos and Wilders, the Dutch Party for Reform leader. The Gays for Trump party at the RNC in Cleveland lasted from 10 PM until 1 AM and was sold out in 24 hours. The below powerful video provided excerpts from that event, including Wilders’ discussion of the problems in the West with Islamism. It’s time for Americans and Europeans to stand up for FREE SPEECH and to stand against radical Islam.